New touring productions at His Majesty’s Theatre in Aberdeen are all set to sweep their audiences back in time to an era of big hair and small skirts. Two new shows announced by Aberdeen Performing Arts (APA) include the 60s show Dreamboats and Miniskirts, to begin a week-long run on Tuesday, August 18 and the international smash musical Hairspray, which opens at HMT on Monday, February 1. Tickets for the shows went on sale to the general public on Tuesday online at www.aberdeenperformingarts.com, by phone at 01224 641122 and at Aberdeen Box Office at the Music Hall and His Majesty’s Theatre. 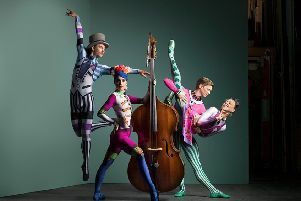 “We are thrilled to be announcing such an amazing line-up of up-lifting and exciting shows for later this year,” said APA press manager Joyce Summers. “We are delighted to see Hairspray return to His Majesty’s Theatre and we are sure fans of this fantastic musical will be thrilled, too. Dreamboats and Minskirts is the 60s sequel to the popular 50s show Dreamboats and Petticoats and follows the story of Bobby and Laura, Norman and Sue and Ray and Donna against the backdrop of The Beatles and the Merseyside sound. The new production of the big, bold and beautiful hit Hairspray kicks off its 29-venue UK tour in Leicester in September and His Majesty’s Theatre will be the first Scottish date the following February. Based on the 1988 film of the same name, it is in Baltimore 1962, where Tracy Turnblad, a big girl with big hair and an even bigger heart, is on a mission to follow her dreams and dance her way onto national TV. Tracy’s audition makes her a local star and soon she is using her new-found fame to fight for equality, bagging local heartthrob Link Larkin along the way.